Yesterday I posted information and photos about the Jesus Tree we are using during Lent. Today I thought I would share information about another new tradition that we have started in our home. It is a tradition for Holy Week, running from Palm Sunday through Easter. Most of these were simple hand-drawn shapes, although I found the "He is Risen" piece inexpensively at Hobby Lobby. I used stiffened felt (also available at craft stores) so the banner will hold up better. The ribbon and pieces have velcro dots on them. 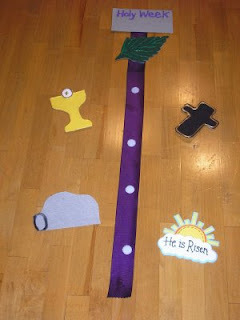 On Palm Sunday, I will hang the banners -- minus the pieces -- on each child's door. Then my son and daughter can attach the palm leaf by matching the velcro dots. The other pieces will be added on each appropriate day throughout the week. I thought this would be a visual way to mark the importance of Holy Week and help them remember everything that happened. Hi I'm here from Catholic Icing where you are featured. love this craft project. thanks for sharing. This is fantastic and so simple! Love it and will definitely be using it! Hi there! I really love this banner and made one for my own children this year, too. I linked back to your post. You are welcome to pop over for a visit at www.joyfulmamasplace.blogspot.com. Thank you so much for sharing your ideas! Beautiful idea!! Thank you for sharing it at the Holy Week link up! !